It’s April 12, 1961 and you are about to become the first person to orbit Earth. Your name is Yuri Gagarin. Yuri’s flight lasted 108 minutes and circled the Earth for a little more than one orbit in the Soviet Union's Vostok spacecraft. Gagarin's flight came at a time when the United States and the Soviet Union were competing for technological supremacy in space. The Soviet Union had already sent the first artificial satellite, called Sputnik, into space in October 1957. Do you think this competition for technological supremacy was beneficial in advancing our knowledge of outer space? Perhaps if we are looking to advance our understandings of this universe and our planet we should be working together as one planet? Let’s take a journey over to the newly formed NASA (NASA - The National Aeronautics and Space Administration formed on the 29th July 1958). NASA responded to Yuri's success by sending Alan Shepard into space in May 1961, Shepard’s flight was suborbital whereas Yuri Gagarin had orbited Earth. Let’s fast forward to February 20, 1962. We are anxiously watching as John H. Glenn, Jr, launches off to orbit Earth. An Atlas launch vehicle propelled a Mercury spacecraft - Friendship 7 into Earths orbit and enabled Glenn to circle Earth three times, making Glenn the first American to Orbit Earth. Through the hype and excited off new technological advancements we too often forget to take a look behind the scenes. So before we hurtle off to the stars let’s first take a look. 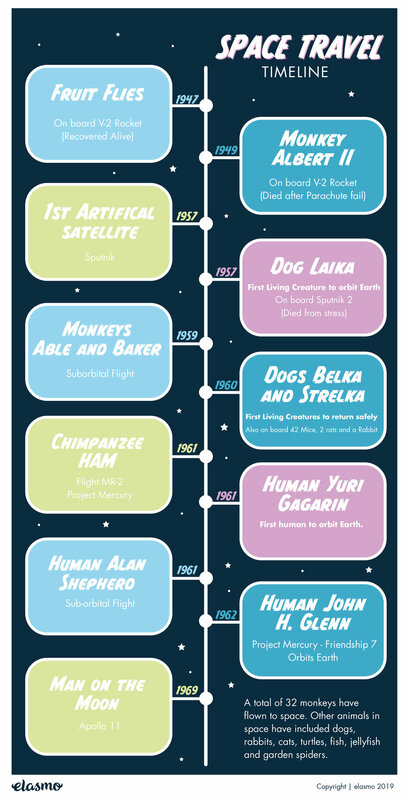 The first animals in outer space where fruit flies in 1947 followed by a mouse launched in 1950. A total of 32 monkeys have flown to space. Other animals in space have included dogs, rabbits, cats, turtles, fish, jellyfish and garden spiders. On the 31st of January 1961 NASA launched the first ever chimpanzee into space. The chimpanzee known as Ham – an acronym for the laboratory that prepared him for his mission, the Holloman Aerospace Medical Centre, successfully completed a suborbital flight MR-2 as part of Project Mercury. Ham’s flight lasted approximately 16 ½ minutes. He experienced about 6 ½ minutes of weightlessness. Ham’s capsule splashed down 130 miles from it’s target and Ham was physically unharmed. The mission would be the United States’ first step in a major project to eventually put a human astronaut, Alan Shepard, Jr., the first American, into space. On the 3rd of November 1957 the Soviet Union launched the first ever living creature to orbit earth. Laika was a stray, found wondering the streets of Moscow. She was promoted to cosmonaut because of her small size and calm demeanour. At 5.30am from Kazakhstan the Sputnik 2 carrying Laika blasted off. For Laika this was a one way trip as there was no way of bringing her back home to earth. Sadly only a few hours into trip no life signs where being received on board Sputnik 2. It is believed that Laika died from over heating and stress. To give you a clearer picture on the time frame in which these events took place we’ve done a timeline! Let us take a moment. Let’s take a moment to pay our respects to all the incredible animals that have come closer to the stars than most. Love space? 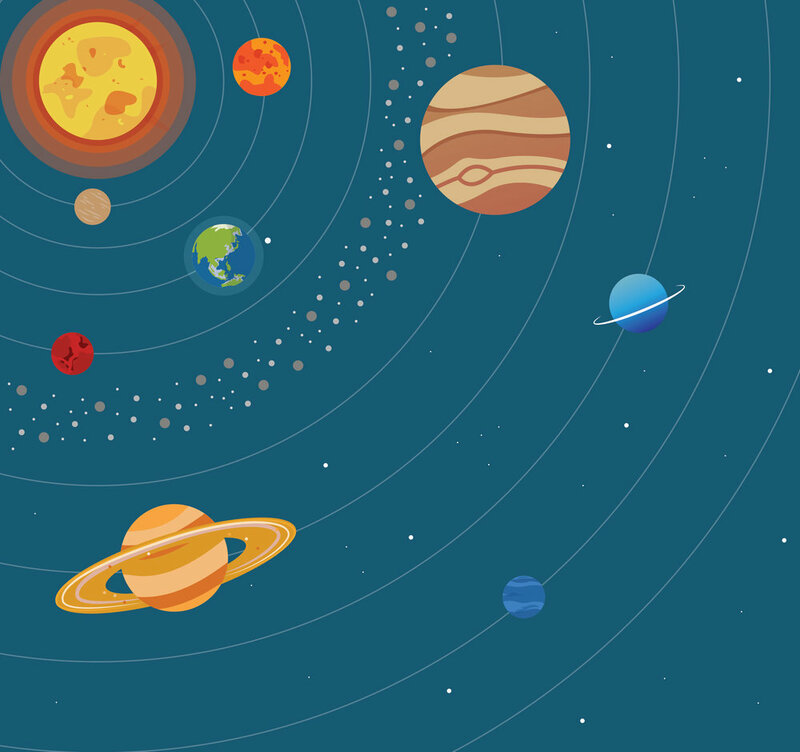 Have you checked out our space posters?